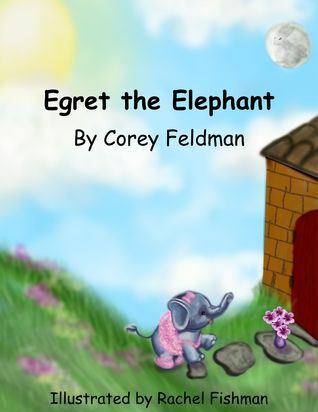 I recently (well, recently-ish- I am way behind) was contacted to review Egret the Elephant, written by Corey Feldman and illustrated by Rachel Fishman. I looked forward to reviewing this because we are always looking for new reading material in this house, and the title seemed to suggest a whimsical tale, which is always a hit at our house. I was not disappointed. The rhymes in this series of stories about Egret and her sister Red, are infectious and add even more spirit to these playful tales. There are seven stories in all, and the tales tend to build on one another to add to the story of Egret, even though they could be read separately. My favorite story is titled "Egret, Red and the Mysterious Light", which explores the friendship between Egret and her sister, and is a great moral for siblings. I also really enjoyed "Egret Dances with Moon Rabbit", which was a perfect story about Egret's dream to send your own child off into dreamland. The singsong quality of the rhymes along with the whimsical story and pictures, are perfect for a sweet bedtime story for a young child. My five month old was very captivated with the story, and even my 5 year old stopped running around to sit and listen to the stories (that's high praise indeed). We will definitely be adding these stories to our bedtime collection. Egret the Elephant is available in both paperback and Kindle versions on exclusively on Amazon. Disclosure: I was provided with a Kindle version of Egret the Elephant for this review; all opinions and experiences are my own. I received no compensation for this review.